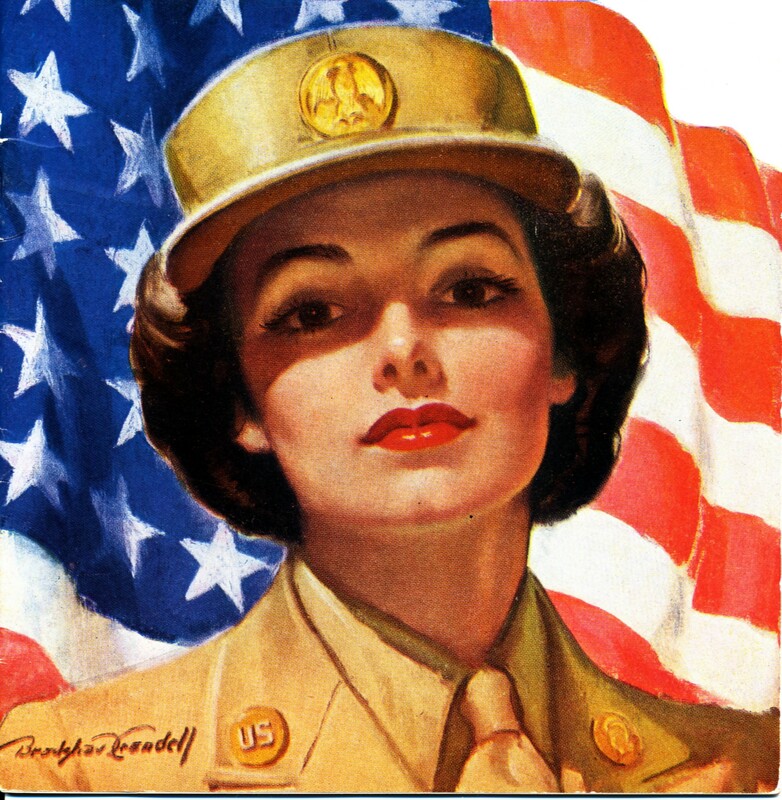 Why Did Women Join the WACs During WWII? 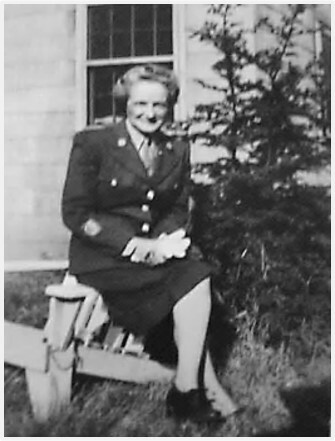 I know so little about Aunt Marian—and to even begin to understand who she was, what she thought, and what her personality was like– I need to understand why she joined the Women’s Army Corps (WACs) during World War II. . . . Was it a search for adventure? . . . patriotism? . . . economic reasons? . . . Most able-bodies men were already in the armed forces. . . . And, there was a lot of just plane datelessness. . . Armed forces recruitment aimed at women—posters and speeches—became more noticeable, and there was pressure to do something specific for the war effort. The pitch was that a woman working at certain “safe” jobs in the services could release a man for active fighting. I think it was a combination of patriotism, idealism, and the urge for adventure that got me seriously considering joining one of the services. I worked as a sales clerk at S.H. Kress. The hours were long and the work was hard, but a fascinating world opened to me. Everybody came to the five-and-dime store I saw boys who I had known at school who had joined the army, looking much improved because of their neat uniforms and newly-disciplined life. . . After more than three years at Kress, I felt a discontent that my life had not changed along with all these changes around me. I wanted to make sacrifices to help my country. . . I gave up my job with Kress and spent a year as a Civil Service employee, becoming more and more aware of women in the military. I realized becoming a WAC would enable me to make a contribution to the war effort while receiving some financial compensation at the same time. I think I made $10 a week and I worked every night after school. This was during the Depression and everyone was poor. . .World War II. I think that probably it gave me more opportunities to do more. It’s a terrible thing to say that a war does that, but I wonder if I would ever really have left Narragansett and done what I did, which was the best thing I ever did in my life. Each woman was in a different situation, and had her own unique reasons for wanting to join the WACs, but their reasons give me clues to the things Aunt Marian may have considered when she made her decision to join. It seemed to be an adventure for them but it was a very bold move on their part. I agree–I wonder why some people make bold moves, while others only dream of making them. I don’t make many. There is a lot of research to be done for this story isn’t there? But you sure are educating us along the way! Love it! Perhaps you will be able to piece together her motivation from various bits and pieces you find in the trunk. She may never have stated or written why to anyone, even herself. I’ll definitely try to piece some of my ideas together based on the items that I have, but you may be right that Aunt Marian may not have fully understood why she made the decisions she made at the time. It sometimes seems easier to understand what motivates someone in hindsight. My aunt was not a WAC, but the war opened opportunities for women. She moved from small town PA to Washington DC to work for the government and had employment with them the rest of her life. I find it really interesting how the war changed the trajectory of many women’s lives, and how, in some cases, it gave them new opportunities. I admired the WACs and remember seeing that poster during the war (I was 9 when the war started). Wow, it’s amazing that you remember this specific picture. It probably worked very well for recruiting purposes. The woman in the drawing looks so courageous and intelligent–yet very beautiful. I’m sure you’ll find out a lot about Marian. I hope you have a few relatives you can interview! She died 49 years ago in 1966, so memories are fading, but she has some nieces and nephews I’m hoping to talk to. I wonder what Marian’s other options were: to stay on the family farm alone, or to live with a married sibling? I’m not sure, but since she had eight living siblings I think that the farm probably needed to be sold to settle the estate. She lived with several married siblings for short periods after her parents died–but I don’t have much of a sense of whether that would have been a long-term option. Historical and family research is such fun. It’s like doing a jigsaw puzzle. The pieces are small, but each of them adds to the final picture. Gather the pieces, and the motivations of your aunt will become clearer as the picture becomes more complete.